Get bathroom-related tools and gadgets that you can access directly on your tablet. Our interactive apps and mobile services offer you quick solutions, fun and inspiration. You can look forward to efficient, convenient infotainment without the need for a computer – no matter where you are. At a bathroom exhibition, for example. Step into our virtual showroom, see how your favourite bathroom and kitchen products look in your own home, learn about interactive showering fun and locate a dealer in your vicinity. Design your shower, wash basin and sink virtually: simply download the app, take a photo of the existing setting, erase the old shower head or tap, replace it with your favourite Hansgrohe product - done. 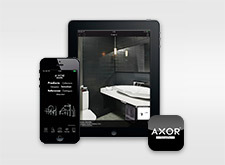 The mobile product catalogue from AXOR: get inspiration from the AXOR App and support when selecting mixers and showers. 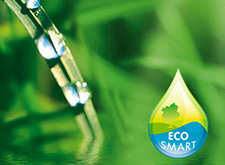 With Hansgrohe's water savings calculator for tablets and smartphones, you can calculate the savings potential of mixers and showers featuring EcoSmart technology even when you're out and about.